This post will be about the basing project I just started. For this base I had an idea about a small group of adventurer on there quest for a hidden treasure or or monster or something like that. The base was planed around a branch (or if it was a larg root?) that i collected last summer. It have been laying in a box since then and I didn´t really know what to do about it more then I like the look of it. 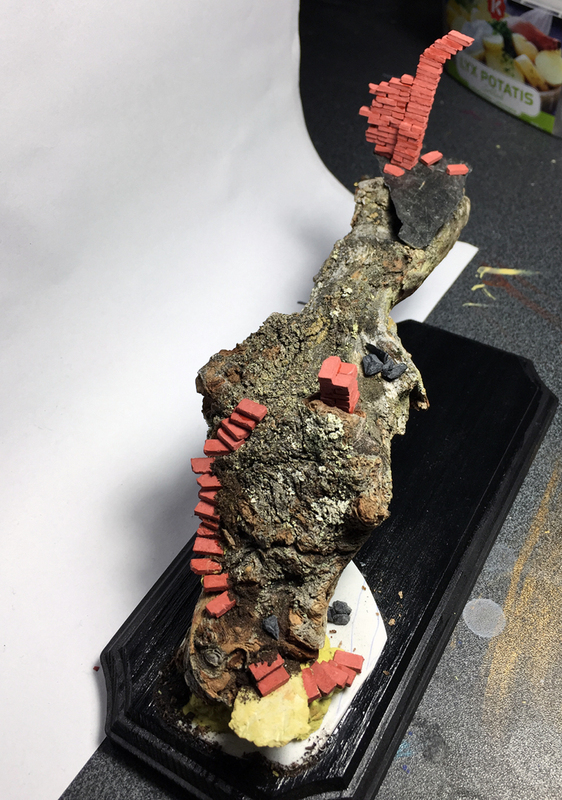 I started out by cutting a flat end to one side of it and glued it on a pice of plasticard and then the basing begun! took some small bricks from Juweela and built a staircase as well as half a doorway and added a pice of slate to the end of the root. I then filled some gaps with milliput and common dirt. 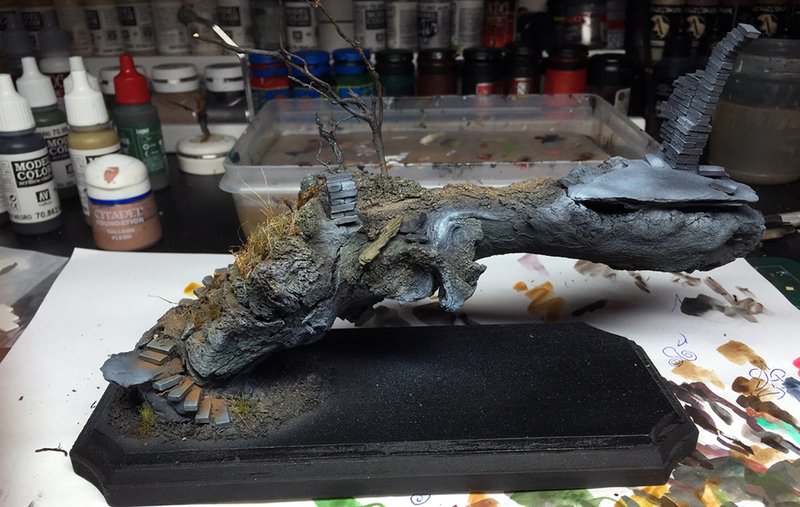 I didn´t used much common dirt at all on this one since the branch already got some really intersting textures. There is really no way you can defeat Mother earth when in comes to texture! 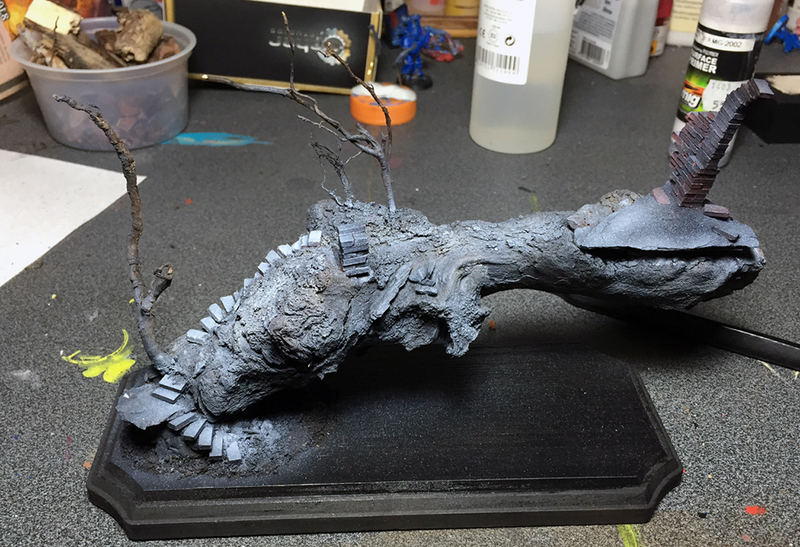 The small trees on the base was just some small roots that I glued in place. The base is already primed on those pics, sorry got carried away! 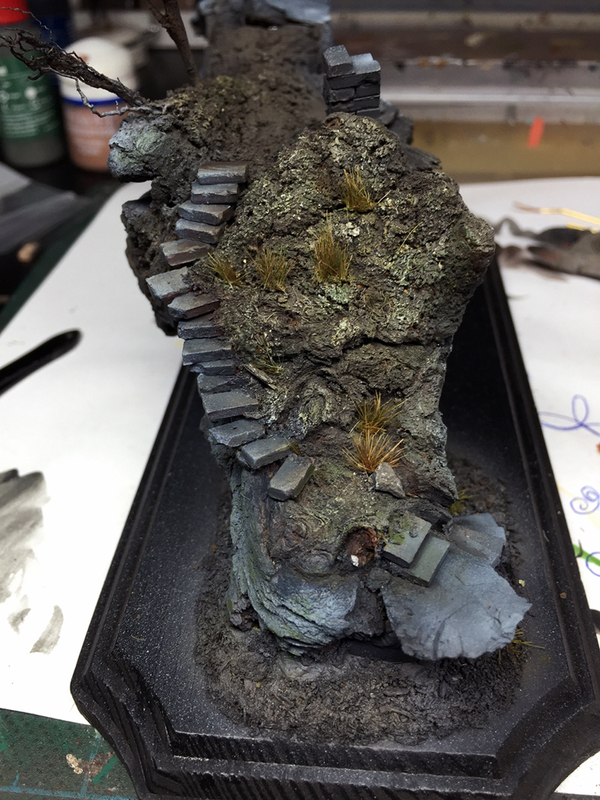 Then I started painting using Black brown (VMC 70.822) as a base for the grund and Black grey (VMC 70.862) as a base for the stones. The ground was then highlighted by adding Khaki (VMC 70.988) to the Black brown followed by some White. The green parts are done with Reflective green (VMC 70.890). 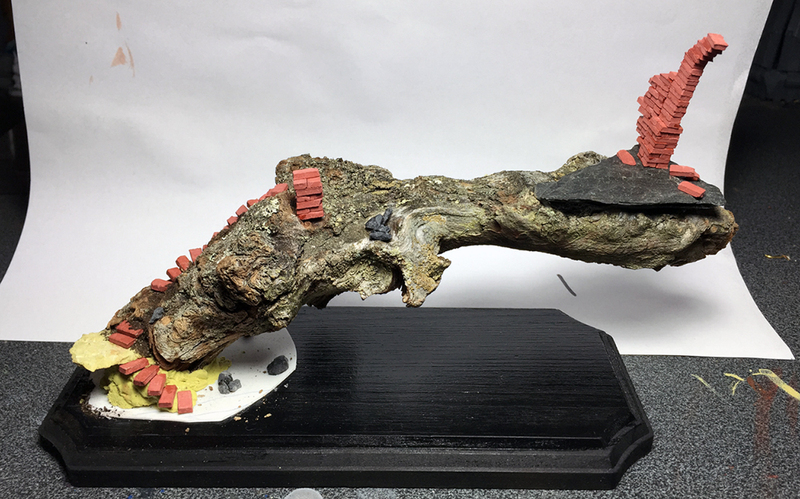 In this picture I already began to add some grass and vegetation to the base. I did that because I wanted to have a clear picture of what I was doing rather then paint the wjhole scene and then add vegetation. When I strated to paint I decidet to remove one of the trees to better reach all areas. I will add it later. And The next step. I work with glazing and some kind of “drybrushing” on the textures. 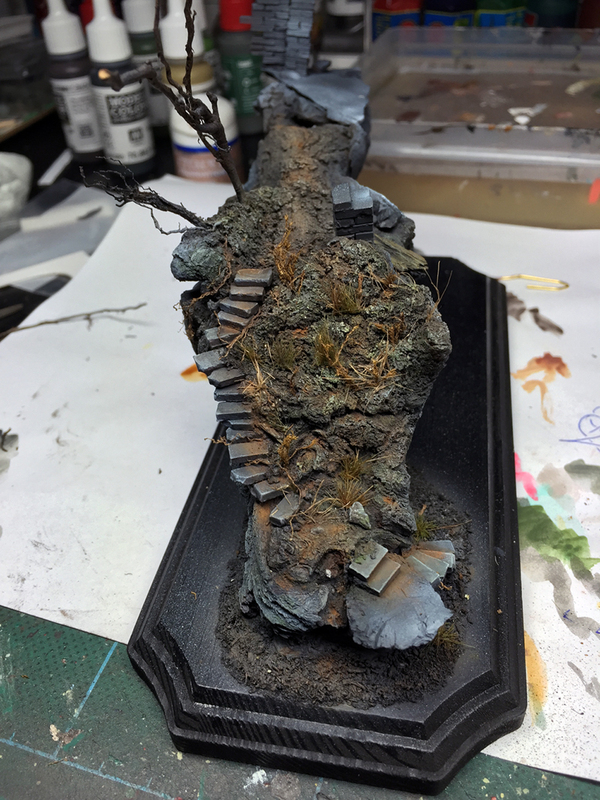 The glazings on the stone was made with Last shadow from “Andrea blue paint set”, it´s kind of like Deep blue sea, any dark blue will do the trick! 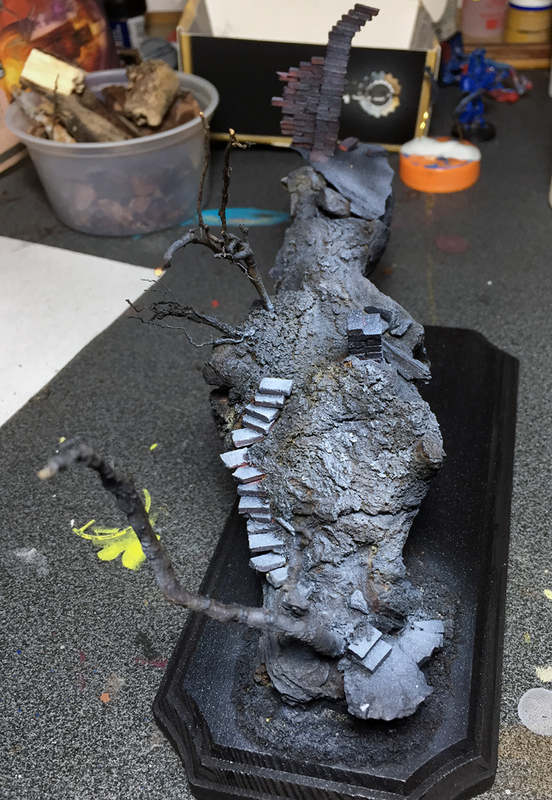 The dusty parts was made using Light earth pigments from Forge world. 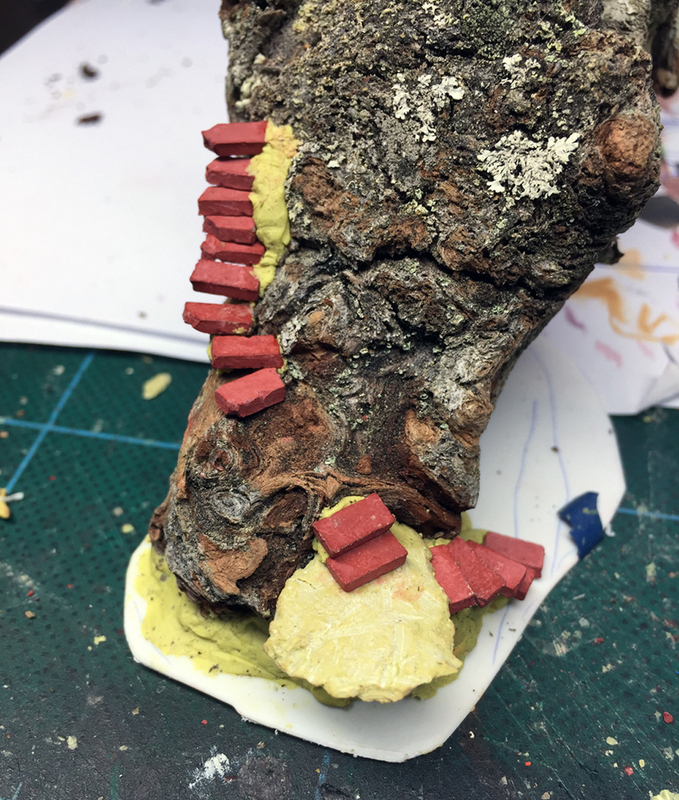 A sideview of the base, still an early WIP but I´m getting there. Eventually! The most important thing I discovered when I started on this pice was that the moment I stopped careing about the final result I found joy in painting and really got stuck in a positive mood. So, push it but, don´t focus on the result! Untill next time, keep ypur burshes pointy and your colors wet.